Meramec Valley Grotto members sometimes spend their weekends looking for locations of caves reported to the Missouri Speleological Survey. On a cold, rainy Saturday morning, about a dozen people hopped out of their trucks with helmets, headlights and other climbing gear at the side of a gravel road in Summersville, a small Ozark town located almost 200 miles from St. Louis. 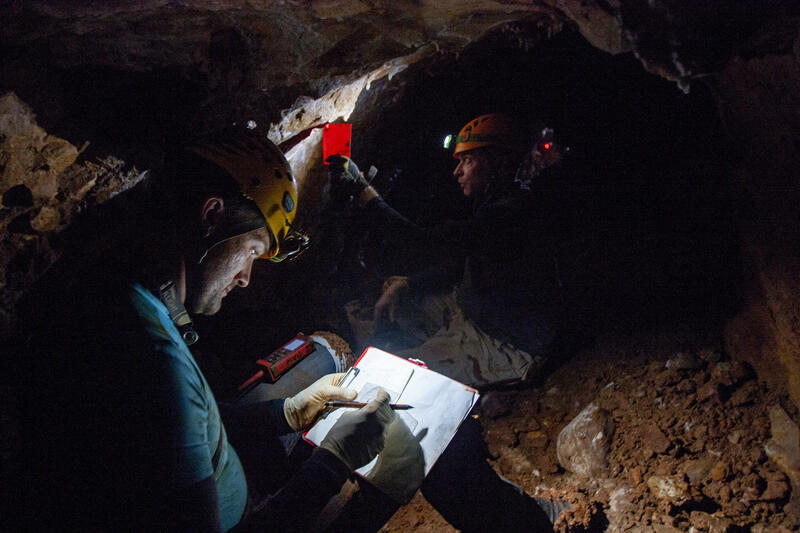 They arrived on a mission to find five caves off the trail of the state-owned Gist Ranch Conservation Area, relying on decades-old records from the Missouri Speleological Survey. Many records of Missouri’s caves don’t contain precise locations, since a lot of them were reported before sophisticated mapping technologies were developed. The state largely relies on recreational cavers to help track them down. “We like being out, we like hiking. We like being in the woods, the adventure part of it,” said Jim Ruedin, a St. Louis-area resident who has explored caves for more than 20 years. “Even if we don’t find a cave, we still had fun." 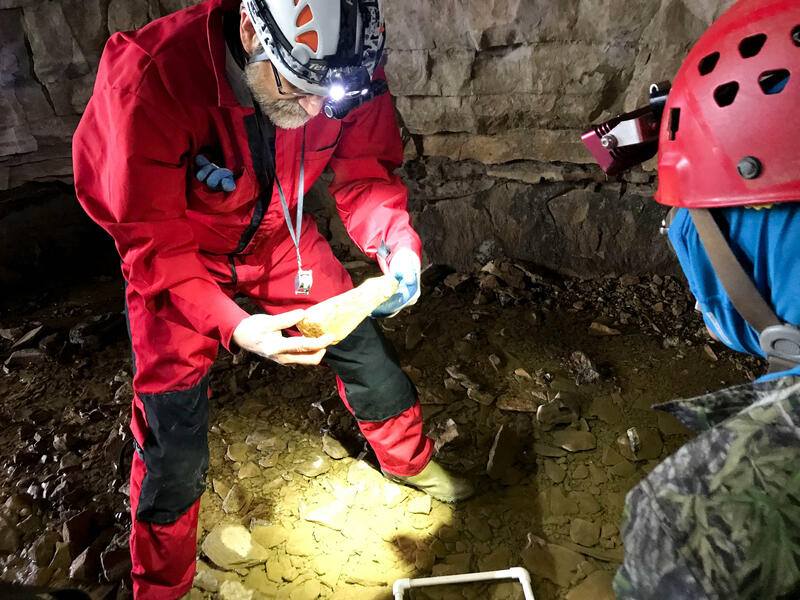 St. Louis Public Radio's Eli Chen reports on a group of outdoor enthusiasts who are mapping exact locations of Missouri's caves. According to state data, Missouri has more than 7,000 caves, the second greatest number of caves in the country (Tennessee has more than 10,000). The caves sometimes contain endangered species and artifacts from indigenous people. Explorations provide useful knowledge to the state, in case a developer wants to build in an area that may have caves. Ruedin, a member of the Meramec Valley Grotto, led the recent survey in the Gist Ranch Conservation Area. 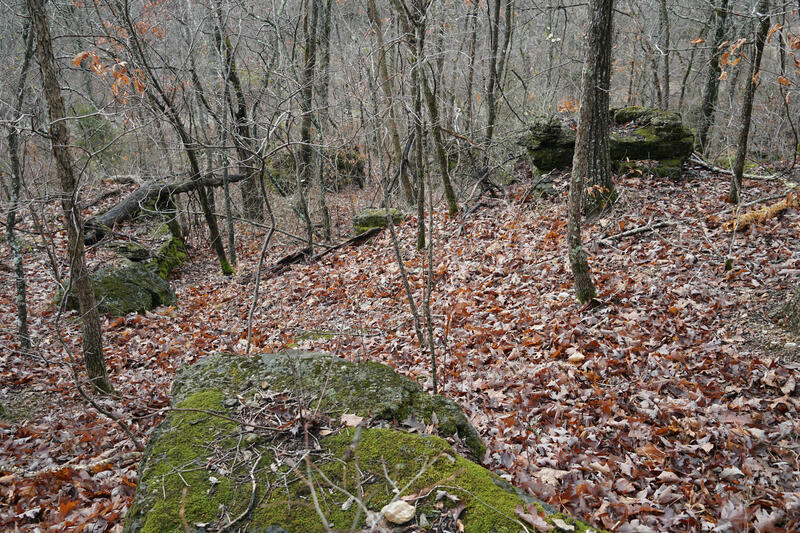 It was the first time that members of the group, most from the St. Louis area, had looked for caves in this part of the Ozarks. As he held a map in his hand, he rallied other cavers in a circle around him. “We’ll try to find this Rattlesnake Cave first,” Ruedin said, before asking caver Joe Light to ask if he wanted to take the map. Jim Ruedin led the group of cavers at a recent survey in Gist Ranch Conservation Area in Summersville, Missouri. 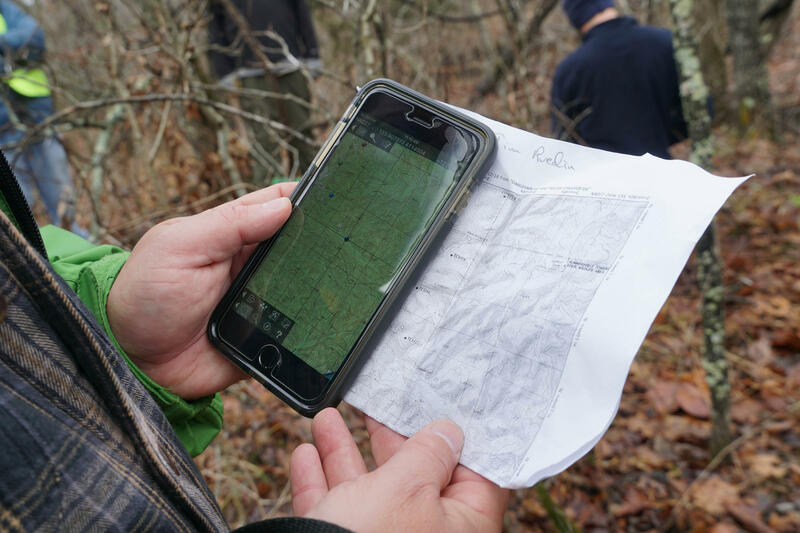 He's holds a map with his phone, which displays a topography app that helps cavers find their way towards caves. The cavers also use a topography app called Topo Maps, which shows physical features of an area on their phones. It’s useful because it works in areas where there’s weak cell signal, so it helps them look for caves and also find their way back, in case they get lost and separated from other cavers. Often, people will stray far from the trail to find caves. The group struggled to find Rattlesnake Cave. That’s a reference to karst topography, a geologic term often used to describe areas where there are sinkholes and caves. There’s very little information about Rattlesnake Cave, so the location reported to the state likely isn’t precise, Ruedin said. He was more confident about finding the other caves, since the records seemed more reliable. After an hour of looking, they cavers began their search elsewhere. There are thousands of caves in Missouri, because limestone and dolomite underlie about two-thirds of the state. Limestone and dolomite are soluble, meaning that groundwater and rainwater move through the rocks and dissolve them to form caves. St. Louis’ geology is largely defined by limestone. But dolomite dominates most of the Ozarks, which contain the largest concentration of caves in the state. Missouri has probably the most caves that are formed in dolomite, as opposed to limestone, said Jeffrey Crews, a geologist for the Missouri Geological Survey. It seems counterintuitive, he added, since dolomite is less soluble than limestone. Rock outcroppings, such as the ones pictured here, can be a sign that a cave is nearby. Limestone and dolomite deposits in the area likely occurred during rising sea levels that happened between 300 and 500 million years ago, Crews said. Before, the land that became Missouri had igneous rocks because of volcanoes in the area. Unlike caves in other states, Missouri’s are largely horizontal, due to “flat-lying” rocks that move water horizontally towards rivers and streams. The shape of rocks are largely influenced by mountains in the area. More mountainous states, like Tennessee and Kentucky, have more vertical caves. Recreational cavers provide very useful information to state agencies, Crews said. The data informs them about potential environmental hazards, in case a utility company wants to build a landfill where a cave might be. They also shed light on the state’s water resources and help map spring systems. The Meramec Valley Grotto finds about 100 caves a year. “The citizens of Missouri have actually gotten a pretty good deal from these volunteers over the years,” Crews said. Many cavers, for example, will help look for animals that are endangered or are relatively unknown to scientists. On a Saturday afternoon in December, Bob Weck, Illinois Speleological Survey president and biology professor at Southwestern Illinois College in Belleville, led a group of volunteers and high-school students into Cliff Cave in south St. Louis County to find cave snails. While standing in a stream, he picked up a rock and asked an ecologist next to him to document it. Weck was interested in cave snails because few have been found. Bob Weck, a biology professor at Southwestern Illinois College in Belleville, examined a rock to look for cave snails in Cliff Cave, located in south St. Louis County. Other caves contain Native American artifacts or fascinating items that help shed light on human history in the distant past. Craig Williams, a Meramec Valley Grotto member with an archaeology background, recalled a rare find about 10 years ago in a cave found at a farm near Springfield, Missouri. “Cavers rappelled in, and they found that at one time, there was a walk-in entrance, and there’s prehistoric human footprints still in them, and torch marks,” Williams said. Only 12 caves in the United States have prehistoric human footprints, he said. Cave surveyors taking notes in a cave in Ste. Genevieve County. After about five hours in the woods looking for caves, the group began to give up. One caver, however, was determined not to give up, so he waded across a fast-flowing stream to look at an area that the others agreed looked like it potentially had a cave. Adele Ayres, another Meramec Valley Grotto member, called out at him across the stream. It can sometimes be hard to explain the appeal of caving to people outside of the group, Ruedin said. But even though the group’s members did not find any caves on its recent excursion, Ruedin said they still enjoyed the experience. If you’ve ever wondered where in the world the “natural bridge” in Natural Bridge Road comes from, you’re not alone. The answer is tied to Missouri's abundance of caves and the underground world of St. Louis. It’s a question Joe Light, vice president of the Meramec Valley Grotto and member of the Missouri Speleological Survey, gets asked all the time. Several Curious Louis questioners have wondered the same thing.